Last weekend we ventured out to reach Arete Forks, which lies near the upper reaches of the Waingawa River in the Tararua Range. 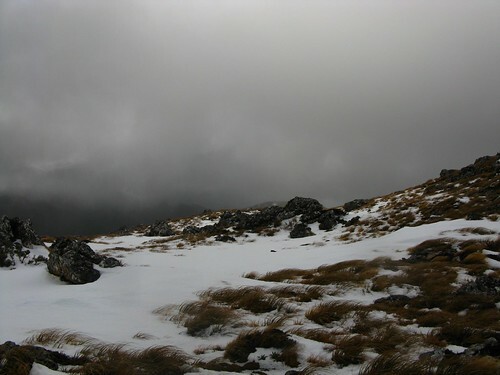 Rather than take the most direct route, a fairly boring sidling track, the four of us intended to climb up over Waingawa Peak from Cow Saddle, before dropping into Arete Forks Hut on the far side. Megan S following the south-west spur off Waingawa (1423). Pinnacle Spur and Tarn Ridge in the background. 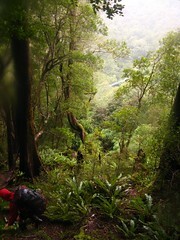 Location: Tararua Forest Park, Kiriwhakapapa Road End. People: Amanda, Megan S, Megan B and me. 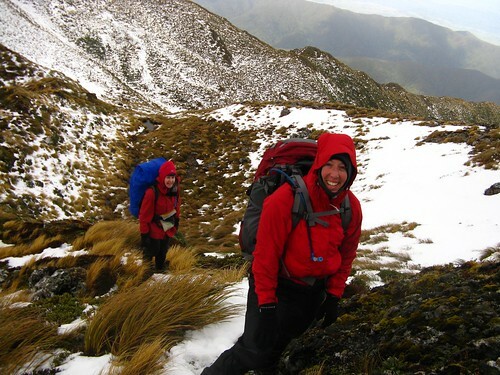 Huts visited: Blue Range Hut (1 night), Arete Forks Hut (1 night), Cow Creek Hut (0 nights). Route: Up to Blue Range Hut from Kiriwhakapapa on Friday night, then down the track and veer onto an old track to Cow Saddle. 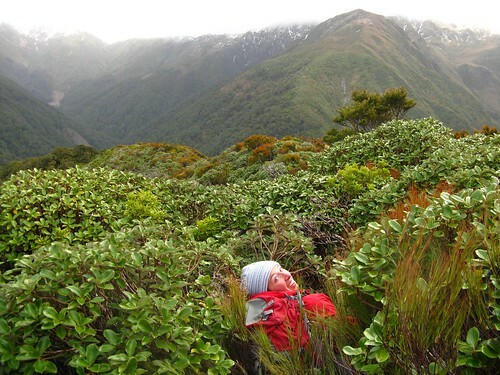 Up to spot-height 1360 via the track onto Cattle Ridge, then a few hundred metres past Waingawa (1423) and down an overgrown spur direct to Arete Forks Hut for Saturday night. Out via the horrid sidling track (with the river being too high) to Cow Creek Hut, and back to the Kiriwhakapapa Road End. Coming after an unusual week of strong, persistent nor-westerly wind, things didn’t exactly let up, and we were concerned that the continuing conditions might prevent us from getting onto the tops. Having been dropped at the Kiriwhakapapa road end at 8.30pm, we took a little under 2 hours to climb up to Blue Range Hut, our passage being accompanied at the higher elevations by a roaring jet-plane kind of wind. For me personally this is the third time I’ve climbed to Blue Range Hut in the dark, and I was a little surprised when the surroundings appeared unfamiliar for what I’d been expecting. All that had happened was that we’d walked straight past the turn-off sign without noticing, and at that time I’d not been expecting to see the comparably open section of track with violently waving head-high trees. Blue Range Hut was already occupied by 10.30pm on Saturday night. This was no surprise, because we’d already encountered three friends (Lorraine, Caroline and Simon) in Carterton who’d coincidentally decided to do something similar to ourselves. It was the other 4 people that made things nice and extremely comfy. The wind outside made fly-camping seem very unattractive, but with some creativity we all managed to crunch in — eleven people in a 4 bunk hut. This configuration, which we managed after shifting the hut’s table outside, involved six people double-bunking between three of the bunks, and another four on the floor. It wasn’t until 6am the next morning that I spotted something moving, get up and turn around, that I realised there was also a big, quiet and well-behaved dog triple-bunking between one couple. Fair enough, it was cute and it wouldn’t have been fair to kick out anyone in that wind. So, nice to get to know you all. 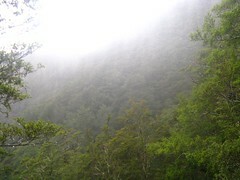 There were a surprisingly large number of people out in the Tararuas this weekend, especially given the grotty weather. It turns out we’d picked a weekend during which the Vic Uni tramping club was out in force to attempt to bag every hut in the Tararuas. I found out later that this time the Tararuas had the last laugh, of course. Getting away shortly after 8am on Saturday morning, I sneered at the sign pointing down to Blue Range Hut, wondering how we’d managed to walk straight past it without realising the previous night. I think it’s because the sign itself is slightly above the junction, and so if we had gone the wrong way we’d probably have seen it. If anything, it’s comforting to know that the more natural track to follow is the one that reaches a dead-end at a hut after 10 minutes. The strong wind of the previous night had died down somewhat, promisingly, but was still present. For now at least the tree-cover protected us. Despite the wind, it was quite clear, and at the brief rocky out-cropping that let us look over the Waingawa Valley in front of us, we could see a long way with often-blue sky and little interference from rain or fog of any sort. We didn’t want to go all the way down to the Waingawa River, only wanting to get to Cow Saddle. For this purpose there’s a handy old track that’s no longer shown on modern maps. It heads over spot-heights 970, 890, and 810 before dropping into Cow Saddle itself. A good technical way of finding the starting point of this side-track is to keep an eye on the bearing of the official track — it heads generally north for about 500 metres, then suddenly veers to the west. At the point that it turns, the old side-track leads off to spot-height 970. The cheating way to find the start of this track is to not watch bearings at all, and simply keep an eye open for a lone sign that points down to the Waingawa River for no obvious reason. The old unofficial route leads off from directly behind this sign. These days it’s mostly a ground-trail, but it’s marked with occasional tags in places where it’s less obvious. 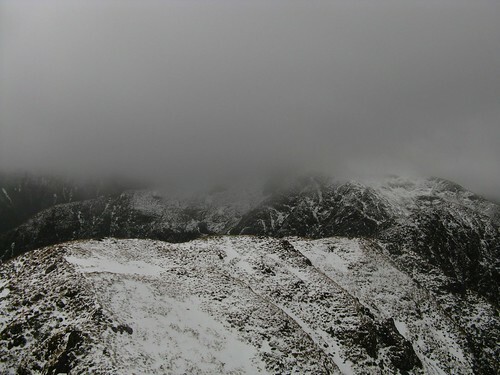 We arrived at Cow Saddle at about 10.30am. While everyone else stopped for a snack, I dropped down the track to the south until I found a trickle of Cow Creek, and filled up my water. It’s a steep drop with the creek being maybe 3 to 4 minutes away, and if I’d realised the track we were about to climb would have another stream crossing after 45 minutes, I don’t think I’d have bothered. We got away from Cow Saddle about 10 minutes after our arrival. From Cow Saddle we made our way up the marked track to the bush-line, resting every now and then and reaching the bush-line after about an hour. Small splatterings of snow littered the surrounding tussock and we could finally see Waingawa up ahead, the rest of Cattle Ridge out to the right, and Mitre Peak buried under clout to our left. Fortunately, we could also now tell that the wind wasn’t hammering the tops too much for us to make our way over to the far side. It was gusting quite strongly, and there were odd occasions when I think all of us had problems staying standing. Megan B and Megan S.
By midday we’d reached spot-height 1130, but the wind and the way it can drain people made for some quite slow plodding. Regular points of shelter made it easier to recover from those situations, and the route up to spot-height 1360 is reasonably easy to find in good weather while going upwards. Its main intent is to help people get onto Cattle Ridge, however, so from this point on we were only following the odd cairn up to Waingawa. Not that it was hard to find, of course. It pretty much towered above us by now, and the remaining spur to climb was rather obvious. 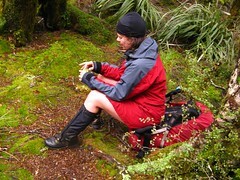 We sat briefly on Waingawa at around 1.20pm or thereabouts, surrounded by snow-decorated tussock. From here it was down-hill again, out of the biting wind and into marginally warmer air. I think I’m glad we did it, and equally glad we weren’t still doing it. Looking approximately north from Waingawa. The next stage of our trip was one we weren’t 100% certain about. There’s a nice spur leading off Waingawa — actually a slightly lower peak a few hundred metres west of it — that drops straight into Arete Forks. This spur has an old track but it’s overgrown in places. A small respite from leatherwood. Most of the route worked fairly well. Soon after dropping onto the spur — we left spot-height 1380 at about 1.40pm — we were sheltered from the nor-westerlies by the surrounding range, and that really helped. Although there’s an old track along the spur, the main hindrance is the presence of thick alpine overgrowth, notably leatherwood. When you’re finding cairns in the middle of head-high leatherwood, it’s usually a sign that a track isn’t used much. In places there’s a ground trail that we tried to follow, although we lost it in places, especially during a section where the spur flattens out for a moment and we became quite tangled. 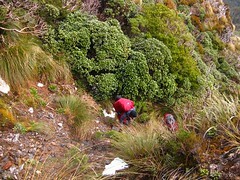 It eventually became apparent that we could get into a small gully in the middle of the spur, with a miniature creek. Although it dropped quite steeply in places it wasn’t as if there was a lack of things to hold onto. Near the bush-line we also needed some time to locate the best way in, eventually finding something that resembled a ground-trail that led into a small hole in more leatherwood. A few seconds of shuffling later, we were in the trees. Something that needs to be said which was noted by Amanda on the way down is that with all the leatherwood, this spur would be harder to climb up than to get down. I’m sure it’s possible either way, but gravity really helps! We set off on a bearing towards Arete Forks, Amanda noting that the bluffy bits above the Waingawa River at the bottom of the spur, so we set our bearing to aim slightly north of Arete Forks rather than on the forks directly. It worked a charm, and at about 4.15pm we emerged at Arete Stream, just a couple of hundred metres away from Arete Forks Hut. 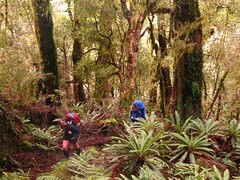 Lorraine, Simon and Caroline had beaten us, having arrived a the horrid sidling track within the last half hour or so. No matter, because this time it’d only 7 people in a 6 bunk hut. No large group from the Vic Uni club made it to Arete Forks, but Stephanie (as a member) was helpfully writing in the book on their behalf. 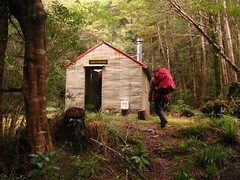 Arete Forks Hut is a standard forestry service 6-bunk hut. It’s in a nice valley, surrounded by a nice river. Even the official LINZ map, however, includes a note saying that it’s flood prone. Sooner or later, it’s likely the river will come up and wash out the ground the hut is stationed on, and it’ll either need to be removed or replaced. It’s nice for now, though. We munched on a noodle mixture with veggies and a home-grown satay sauce courtesy of Amanda, followed by a quickly whipped up chocolate mousse. Megan S tried to pass around mini toffee pops, but they were no match for the regular sized ones I’d brought. Daylight savings changed our clock overnight, and our arrangement for collection at the road meant we’d need to tolerate losing an hour of sleep. I don’t think it mattered for me; I had a useless sleep anyway, having stufed too much into my pillow. We woke about 6.30am daylight time (aka 5.30am standard time) and having waved goodbye to the other group of three who’d be following us at some point, we were out the door 40 minutes later, not bad. 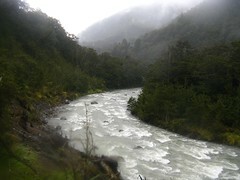 We’d contemplated walking along the river, which is supposed to be a million times better than this sidling track. One of Lorraine’s friends reckoned it’s about 2 hours at a good level, but 10 hours at a worse level. Unfortunately mounting rain put the river level uncomfortably high, making it not really an option we were convinced of. Another option might have been to try getting up to Table Ridge and then back down to Cow Creek Hut, but we could tell the wind was back meaning it wasn’t a realistic option. Thus we were left with the horrid sidling track. As far as typical Tararua sidling tracks go, this one’s also subject to tree-fall and made of slippery tree roots. It’s particularly bad, however, thanks to its tendency to repeatedly switch up the side of the hill, move forwards slightly, switch all the way down the hill, move forwards a little further, travel inwards a lot for a good crossing point for every side-creek, and so on and so on. Let’s be clear — Jonathan Kennett’s recently published Tararua Adventure Guide explicitly defines “sidle” on page 19 as “A track or route that skirts around the side of a hill, rather than going straight up or down (except to Arete Forks)“. People with boring unmotivated lives who want to make their lives that much less inspirational would really find something to live for in this track. It was still dark when we left Arete Forks Hut at around 7.15am. The overcast drizzle combined with the tall tree canopy made sure we’d be walking in torchlight for the first hour or so. Some especially bad tree-fall in the first third of the distance, over roughly a few hundred metres, helped us to lose where we should have been for a while, and it was necessary to do a lot of scouting around. I’m not sure how useful it’d be to try and improve this track, given relatively low use and that any maintenance on such a sidling track will be perpetually contradicting the erosion and weathering of the hillside. I did take a grid reference, though, and flick an email to DoC’s Wairarapa office suggesting that next time someone’s in the area it could be handy if they packed some extra track markers to help indicate a good way around the existing track damage. I figure that’s likely to be more useful than writing in a hut book that’ll likely as not ever be read by someone who could make a difference. There are a couple of slips on this track, once fairly large. I thought it might be awkward to get across, but it’s actually quite easy with the scree being fairly settled. It crossed my mind as I walked over that I definitely wouldn’t want to be standing there at the moment of the next Wairarapa earthquake, though. Higher than usual river levels gave us an excuse to do a technical river crossing on a one of the side creeks, and the four of us arrived at Cow Creek Hut at 10.50am, about 3.5 hours after we’d left Arete Forks. The hut would have been vacant except the previous night’s last two occupants were literally walking out the door as we walked up. They were part of the Vic Tramping Club’s hut-bagging mission, having walked in from The Pines past Mitre Flats and stayed the night at Cow Creek, but admitted they were now regretting the decision to have left Mitre Flats behind given that this hut had had 11 people overnight! (It’s another standard 6 bunk hut.) We sat down for an early lunch as they left, taking about half an hour. along this from Arete Forks. At 11.20am we finally left, crossing the giant monstrosity bridge over the Waingawa, and following the main track back up over Blue Range towards the road. This is the first time I’ve been on this short section of track, and I hadn’t realised it sidles around the edge of the river quite so much. Once it starts going up, though, it’s very persistently upwards and a solid climb, and although the trees generally protected us from the rain, I think everyone was by now very saturated. It was nearly 1pm before we finally reached the point where we’d turned off this main track the day before, to get to Cow Saddle. The climb continued for a further hour, before we finally began to circle around Te Mara Peak, soon reaching the Blue Range Hut junction a little after 2pm. All that remained from here was an 80 minute walk down to the Kiriwhakapapa road end, which was a first time for me to walk on this track in daylight, despite now having visited Blue Range Hut four times. It was strange seeing it in green. I guess with Blue Range being such a good place for off-track navigation that the actual track isn’t so necessary. It was a very worthwhile weekend, I think, and we were all happy we’d been able to get a bit of time on the tops, despite the wind-chill. 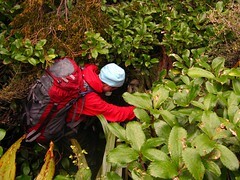 I now also know that the sidling track out from Arete Forks is every bit as annoying as its reputation suggests. Towards the end I wondered if we’d climed and descended more on that track than we’d done the previous day heading over Waingawa, and planned to figure it all out from my GPS record on returning, but unfortunately I messed up the elevation plot so will have to leave that for another time. 8 Comments To "Trip: Arete Forks via Cow Saddle and Waingawa"
Yeah, that track from Cow Creek is nasty. I went in with Ray, Jackie and some others a couple of years ago, in via Te Mara nav then straight back. We all slept Saturday afternoon at the hut (and thankfully there were only 5 of us on the trip, Cow Creek is Small). By Monday I couldnt walk from the steepness of the track! Not somewhere I would go back to, personally. I even warned Mark it would be bad, but he didnt believe me and went anyway, then complained profusely when he got home! Do you mean the one from Cow Creek back up to Blue Range? Yeah, it’s steep. It took much longer than I thought it would to get back to the junction with the old route down to Cow Saddle. At least it’s consistent. Hi Mike, interesting post. I was out that same weekend and did a blue range-cow saddle loop coming back out from Cow Creek on ‘the official’ doc track. There was 10 or 11 of us at cow creek and I camped by the river. 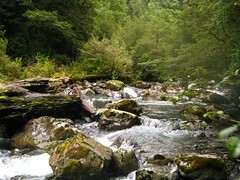 I want to get to Arete Forks and your post gives me some more motivation. Umm.. yes that ‘sidle’ from Arete Forks to Cow Creek is almost unusable in my opinion. I’ve done it twice now and both times were memorably horrid. If I am ever dozy enough to find myself at Arete Forks again I’ll either stream bash down the river… or if that’s not possible.. then I’d probably simply climb up from the hut onto the northern end of Cattle Ridge and work my way around on the tops until I joined up with the marked route that climbs from Cow Creek Hut. There’s likely to be some leatherwood on this alternative, but it can’t be worse that this wretched track. But otherwise…thanks for posting these pics…. I really enjoy looking at old haunts through fresh eyes. Hi Philip. Thanks for the comment. When we walked it recently I’m not certain I’d call it unusable, just very depressing. All that up-hill simply goes down again, and feels as if it’s leading to nothing. 🙂 I’m glad it was there, though, because I doubt we’d have been able to get out on time if it wasn’t. The route over the end of Cattle Ridge worked great for getting to Arete Forks (as I wrote about in this report), except for being a little slow figuring out routes through the Leatherwood… it’d be dismal in bad weather. We thought at the time that if we’d been trying to go the other way (up from Arete Forks) then it would have been much harder, due to the need to force a way up through some quite thick leatherwood. We made a lot of tactical use of gravity to help push through it on the way down, and the brief time I had to back-track having headed down a bad route, it easily took me 3 to 4 times as long to get back to the point I’d started at. Mike…it’s more or less unusable at my age :-). Also I cocked up my geography… I meant to suggest heading south up onto Table Ridge at Point 1478, then heading toward Point 1390. From there I’m pretty certain there’s a good track from there down to Cow Creek. Ah okay. By all accounts I’ve heard it’s a nice track, but I haven’t been up that way myself. Despite not being marked on modern maps, there’s certainly a big grunty official-looking signpost at the bottom of it, leading up from the Arete Forks sidle track.